This morning we went to Vespa Seattle to pick up some gear for Cortny. She got a jacket, helmet, and a pair of gloves. All of it is cute, as per her requirements. 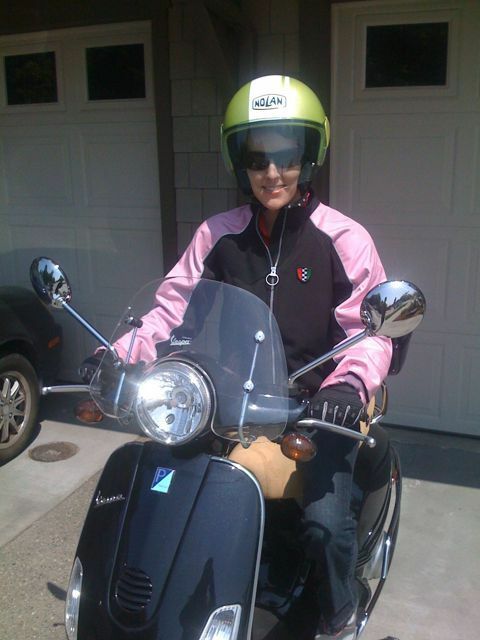 When we got back home, we geared up and headed out on the Vespa. We went to U. Village, to get new iPhone cases. Of course, this is for our new iPhones that are arriving on Friday. It was a lot of fun! Driving with a passenger wasn’t hard, but we should go out and practice some low speed turns. Cortny, all ready to scoot!